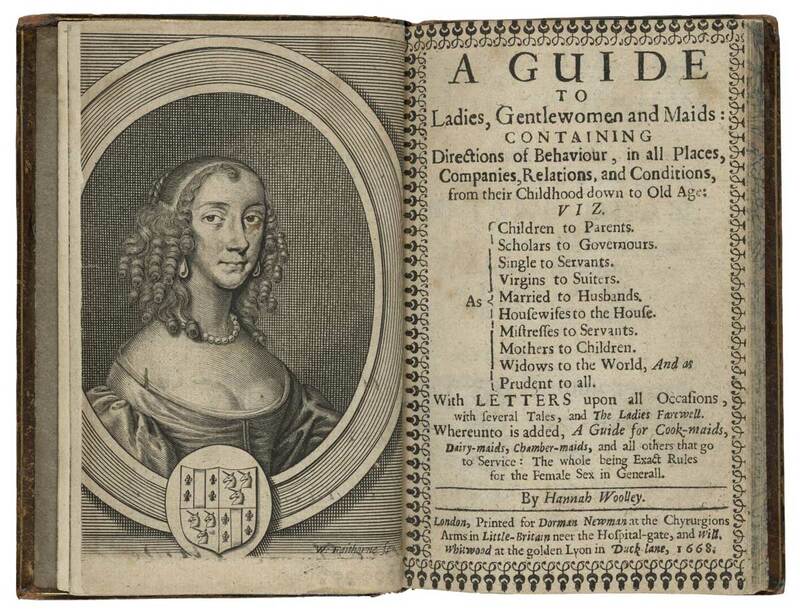 A Guide to Ladies by Hannah Woolley, 1668. W3278.5. Folger Shakespeare Library. Hannah Woolley is no longer a household name, but her name was practically synonymous with the household in Restoration England. Along with the almanac writer Sarah Jinner, she was the first Englishwoman to make her living as an author, beating out Aphra Behn, who is usually granted that distinction, by a decade or so. In a genre then dominated by men, Woolley forged a new path as an author of domestic manuals and books of cookery and preserving, ultimately becoming so popular that her name appeared on new books after her death in order to give them the stamp of authority. She was the Martha Stewart of her time, the English-speaking world’s first female lifestyle guru. Housewives copied her instructions into their own handwritten recipe books, passing down her advice and rhetorical style to subsequent generations. Her books went through numerous editions; one was translated into German. One of these books has sat hidden in plain sight at the Folger since 1990—included in the Folger online catalog, but missing from an international database that scholars often use to search for early English books. It’s a slim, small, unassuming volume of domestic advice, with the fairly generic title A Guide to Ladies, Gentlewomen, and Maids. It was published by Woolley in 1668, soon after the restoration of King Charles II. It is the only known copy of the book in the world. Woolley, Hannah. Supplement to the queen-like closet, or A little of everything. 1684. W3286. Folger Shakespeare Library. 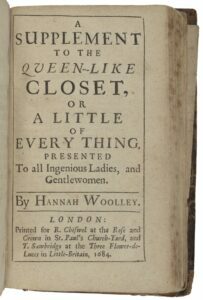 Woolley mentions A Guide to Ladies in her last and most popular book, A Supplement to the Queen-Like Closet. Apparently she’d planned to enlarge the Guide to Ladies, but before she could do so, her publisher, Dorman Newman, went ahead and revised it himself without asking her, adding all sorts of new material and bowdlerizing much of what was already there. That new book, The Gentlewoman’s Companion, published with Woolley’s name on the title page, became one of the bestselling household advice books of the seventeenth century. It has forever since been associated with Woolley’s name, whether she liked it or not. So what was this earlier Guide to Ladies, and what was its relationship to the book that Dorman Newman stitched from its scraps? Until this year, we didn’t know. Now, thanks to historian Sara Pennell, who first alerted the library to the book’s existence; and to Amanda Herbert and Heather Wolfe, who are the curators of the Folger’s current exhibit, First Chefs: Fame and Foodways from Britain to the Americas (Jan 19 – Mar 31, 2019); the book is currently enjoying a coming out party in the Folger’s Great Hall. There it sits among other books that are either by or attributed to Woolley, who is showcased as one of the five “first chefs” of the exhibit’s title. The book is opened to its curious title page, which contains a portrait, supposedly of Woolley, that isn’t of Woolley at all. (See Heather Wolfe’s Collation blog post on the subject for more information). The exhibit closes at the end of this weekend, so come see it before it returns to the library vaults! And if you can’t make it to the exhibition, it has also been fully digitized. Once the Guide to Ladies settles back into the archives, the interdisciplinary team of researchers who comprise Before ‘Farm to Table’: Early Modern Foodways and Cultures, the inaugural project of the Mellon initiative in collaborative research, will encourage the book to yield up its secrets. By looking closely at the Guide, by reading it in light of Woolley’s other works, by comparing it to the works that bear her name but don’t necessarily include her writing, and by thinking about it in relation to larger cultural forces in Restoration England, we hope to gain a deeper understanding of the ways women labored and lived in the period. What was it like to be a lifestyle guru in 1668? What sorts of things did a young woman need to know in order to survive in a confusing and tumultuous professional world? Who owned the book and how did they use it? For answers to these and other questions about Hannah Woolley and the lives of early modern women, stay tuned.